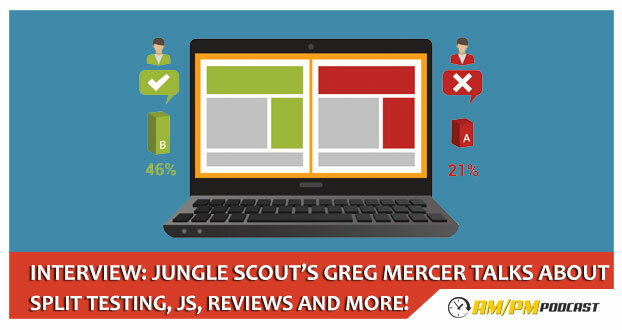 In this interview, Jungle Scout’s Greg Mercer talks about split-testing, keyword optimization, review services, and even goes into a special announcement as well as a great discount on Jungle Scout for the listeners of the AM/PM Podcast. Greg Mercer advises on which products to stay away from. Greg Mercer shares his thought on FBA sellers going to selling heavier products. Greg Mercer shares tips on how to maximize Jungle Scout. What is the importance of listing optimization? How do I benefit from optimizing my listing? How often should I make changes on my listing? What are some easy wins for spilt testing or listing optimization? Greg Mercer shares his ways when it comes to split testing keywords. What can I do with SPLITLY? Greg Mercer shares his future improvement plans and launching suite of selling tools. Disclaimer: The following services were mentioned on the podcast. These are affiliate links which means if you choose to purchase these products by following this link AM/PM Podcast will get a small commission from the sale.